top: MCZ 190265. Port Fairy, Victoria, Australia. bottom: AMS 127044. Glenelg River, Victoria, Australia. Playford, T.J., and Walker, K.F. 2008. Status of the endangered Glenelg River mussel Hyridella glenelgensis (Dennant 1898) (Unionoida: Hyriidae) in Australia. Aquatic Conservation: Marine and Freshwater Ecosystems 18(5): 679-691. Sheldon, F., and Walker, K.F. 1993. Pipelines as a refuge for freshwater snails. Regulated Rivers: Research & Management 8(3): 295-299. Walker, K.F. 1981. Ecology of Freshwater Mussels in the River Murray. Australian Water Resources Council Technical Paper No. 63. Australian Government Publishing Service, Canberra. Walker, K.F. 1981. The distribution of freshwater mussels (Mollusca: Pelecypoda) in the Australian zoogeographic region. In Ecological Biogeography of Australia. Edited by A. Keast. Dr W. Junk, The Hague. pp. 1233-1249. Walker, K.F. 1998. Molluscs of inland waters. 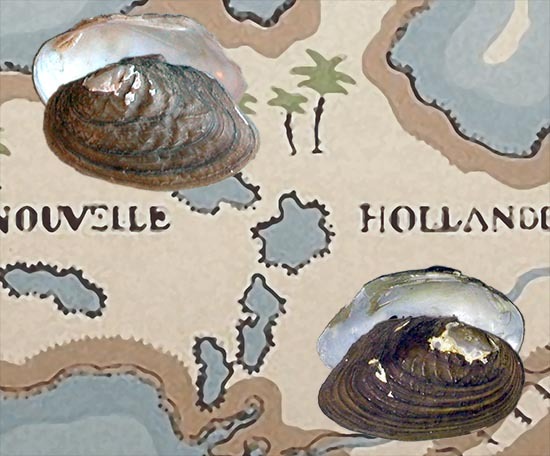 In Mollusca: The Southern Synthesis. Fauna of Australia. Edited by P.L. Beesley, G.J.B. Ross and A. Wells. CSIRO Publishing, Melbourne. pp. 59-65. Walker, K.F., Byrne, M., Hickey, C.W., and Roper, D.S. 2001. Freshwater mussels (Hyriidae) of Australasia. In Ecological Studies. Ecology and evolution of the freshwater mussels Unionoida. Edited by G. Bauer and K. Wächtler. Springer, Berlin. pp. 5-31. Walker, K.F., Jones, H.A., and Klunzinger, M.W. 2014. Bivalves in a bottleneck: taxonomy, phylogeography and conservation of freshwater mussels (Bivalvia: Unionoida) in Australasia. Hydrobiologia 735: 61-79.